Youâ€™ll find Honda most often on or near the bullâ€™s-eye, what with the Accord, the Odyssey, the Civic, and the CR-V all nailing their targets through the crosshairs. From the center, Honda believes, thereâ€™s no direction to go but off the mark, which is why the 2007 CR-V remains pretty much what a CR-V has always been: an inexpensive five-seat duffel bag on wheels. 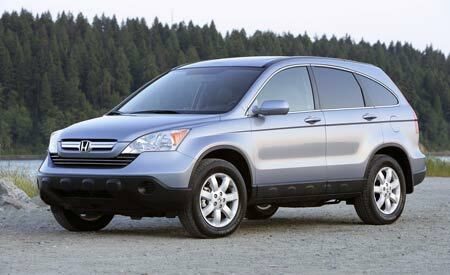 For 2007, CR-V project leader Mitsuru Horikoshi is after the â€œcool moms,â€ which in Japanese sounds like â€œkakko-eee mama-san.â€ Apparently, the cool moms like windshields that lie back, a body with a few curves, an Acura-like interior of metrosexual black plastic and burnished metal, and side glass that does the most suggestive rearward taper since the â€™49 Buick. The new CR-V strives to look more street chic in every way except for the warts growing out of the lower rockers, a styling clichÃ© suggesting skid plates that are so not there. We wonâ€™t gainsay Hondaâ€™s wisdom. With one four-cylinder engine and one five-seat configuration, the Honda CR-V rang up 150,219 sales last year, a big number in a growing segment (the Escape was the only compact ute to beat it, with 165,122 sales). Horikoshi-san says the new CR-V has its own platform, sharing just seven percent of its parts with the Acura RDX (and nine percent with the Civic). Although just two percent derives from the old CR-V, the dimensions and the cargo-volume numbers donâ€™t vary much. News that body width grows by 1.4 inches isnâ€™t worth waking the President for. More significant, Honda moved the spare tire under the floor and replaced the side-hinged ambulance door with a top-hinged hatch. That helps push down the CR-Vâ€™s center of gravity by a very cool 1.4 inches. Combined with a few subtle suspension changes, Honda advertises better handling with the new CR-V. At this early stage, we can report that it seemed quieter, and its steering is a bit heavier. Making 166 horsepower is a familiar 2.4-liter, dual-cam 16-valve four with i-VTEC variable valve timing and lift, good for 161 pound-feet of torque. Sadly, thereâ€™s only one transmission, a five-speed automatic. The optional four-wheel-drive system uses the same twin-hydraulic-pump design to engage the rear axle through a wet clutch pack. There are no computers, but new ball cams get the clutch pack engaged faster while the pumps are still building hydraulic pressure. The goal is quicker rear-axle engagement on slick roads. Honda promises that prices will change little. You wonâ€™t get to the exit for less than $21,000 for the base front-drive LX and $27,000 for the all-wheel-drive EX-L, a new leather-lined trim level and the only one in which a navigation system is available, for an extra $2000. Yes, even kakko-eee mama-sans get lost.